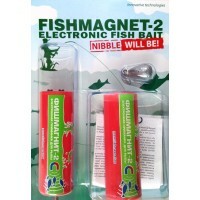 FishMagnet-2 is an electronic fishing bait that is an alternative to the natural baits, which the anglers usually use, such as bread, porridge, dough, etc. However, the electronic bait is more convenient in use, allows to reduce duration of preparation for fishing, giving the chance to find more time directly for catching. 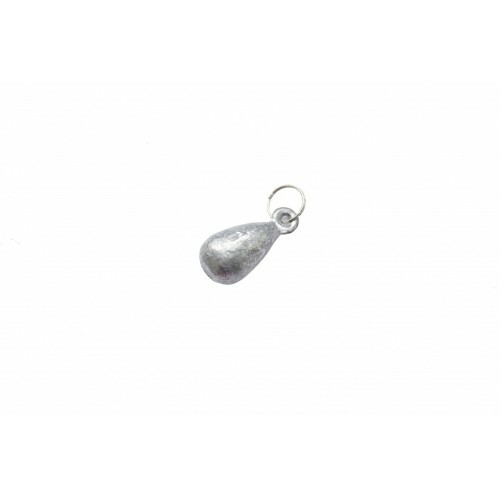 There is no risk overfeed your fish that is always present when natural baits. Finally, the use of a "reusable" e lure more profitable economically - with careful operation it will serve you for years. The task of the device — to allure fish to the area of fishing from other part of a reservoir, and result of catching of the allured fish depends on all those factors on which fishing and in any place depends at all times: tackles, baits, experience of the fisherman, good luck and so forth. Thus, use of the device increases chances of the fisher of success in the absence of fish in a fishing place, keeping thus an intrigue of process of catching. 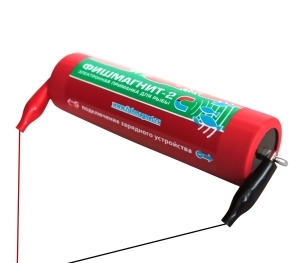 "FishMagnet-2" is suitable for fishing in the summer and in the winter, both in fresh water and in salty water. The device is powered from the battery with a large number of charge cycles. 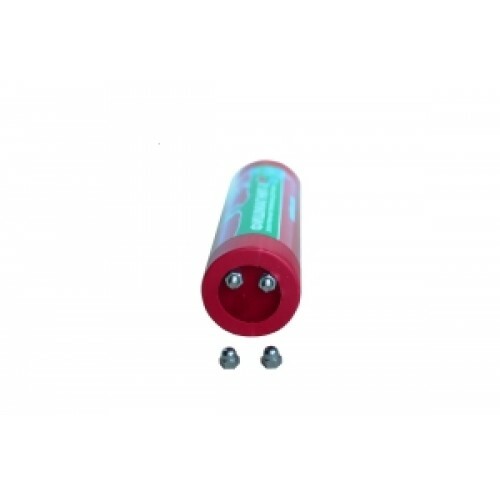 A fully charged battery lasts up to 120 hours of continuous operation, the process of charging takes less than an hour. The depth of use, the location of the device and bait usage time for fish get out empirically by depending on the type of fish, composition water, density and water temperature, time of year and day, structures of a reservoir or the water area, used tackle for fishing. At immersion in water the device starts working automatically. The "switch" role is carried out in this case by water which, as we know, is the conductor of an electric current. Thus, the device turns on as soon as between electric contacts on a red face cover of the device there is a water. It must be kept in mind that conductivity of water is much lower, than metal therefore the signals generated by the device in water are significantly weaker, than what it radiates at short circuit of contacts by a metal subject. However, and sense organs of fishes considerably more, than human, are susceptible to the signals generated by the device. All known ways of attraction of fish affect separately one of five natural instincts of fish. "FishMagnet-2" allures fish, influencing at the same time on 3 of them: sight, hearing and sensitivity to vibration. 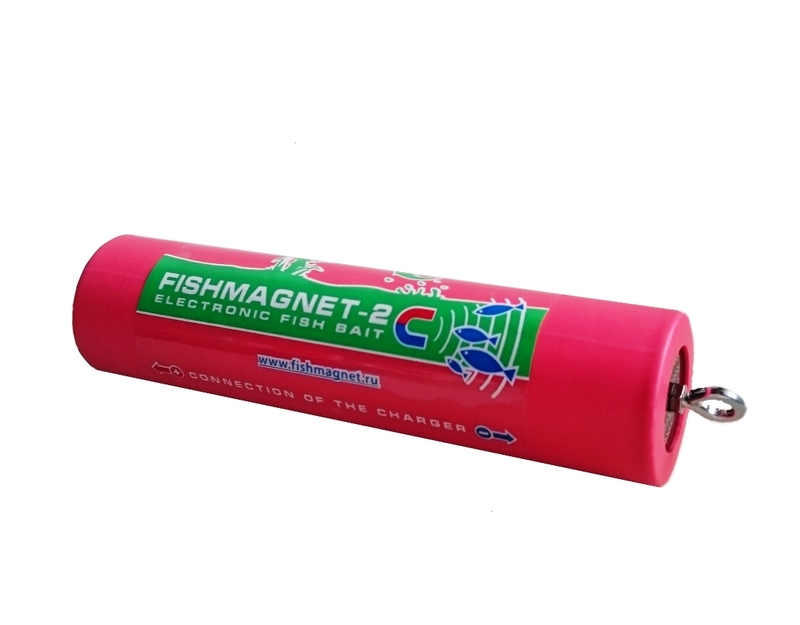 As a result, fish all receptors feels influence of "FishMagnet-2" pleasant for it, comes nearer to the device from the remote parts of a reservoir and turns in a radius of 1-20 meters round a bait. 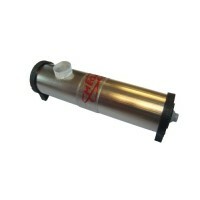 The device when taking out from water, is switched off automatically. 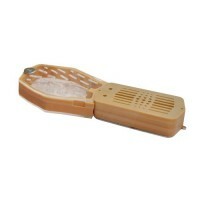 The device is equipped with a standard or increased capacity battery. 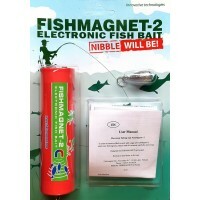 FishMagnet-2 is available in 7 modifications (STANDART, UNIVERSAL, LUX, LUX MAXIMUM, SUPER SOUND, MODERN, MODERN PLUS). 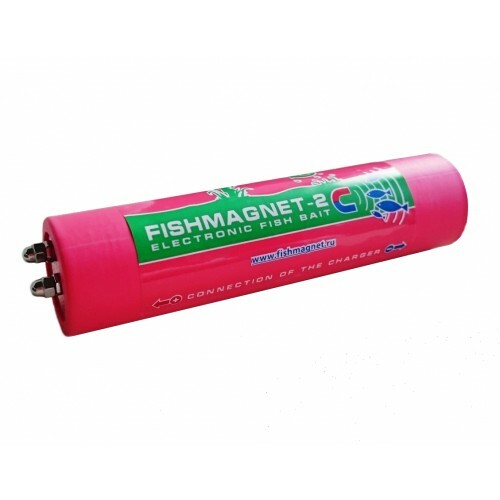 Fishmagnet-2 SUPERSOUND is a 2-frequency version of Fishmagnet-2 LUX bait, with the possibility to control the intensity of acoustic, light and vibration signals. 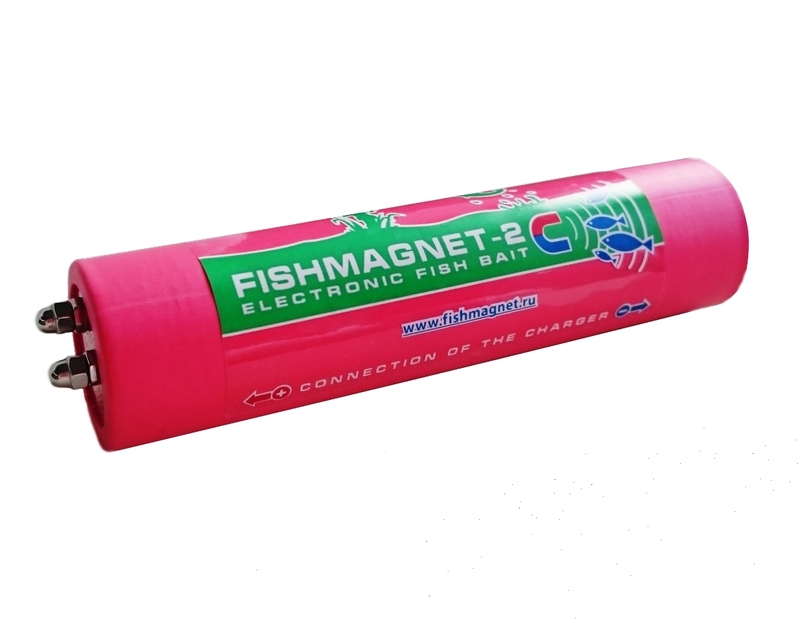 Fishmagnet-2 SUPERSOUND is equipped with an increased-capacity battery and universal charger of the basic configuration. Using sounds of both low and high frequency allows expanding acoustic effect on the fish and attract different species of fish reacting to the sounds of different frequency. 1. Emitters of acoustic signals in 2 frequencies: low and high ranges. 2. Possibility to change the intensity of acoustic, light and vibration signals using 3 supplied jumpers for closing the contacts. 3. Increased-capacity battery as standard. 4. Advanced electrical schematic of the device. 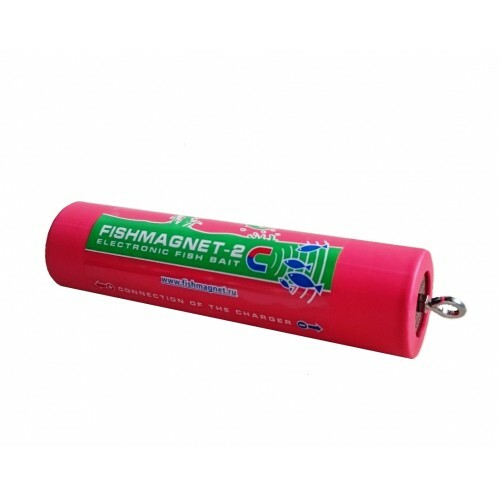 FishMagnet-2 is manufactured in the form of a cylinder closed with end caps of red and black colors, or with transparent and black cap. The red end cap being is a light-emitting element has stainless steel electrical contacts. One of the contacts (according to the marking) is also a positive side of the device charging circuit. The negative side of the device charging circuit is on the black end cap. It looks like a ring screw through which quite a thick fishing line or cord is passed. Use a universal charger to charge the device battery. Device charging time (in case of incomplete battery charging) is 50-60 minutes. 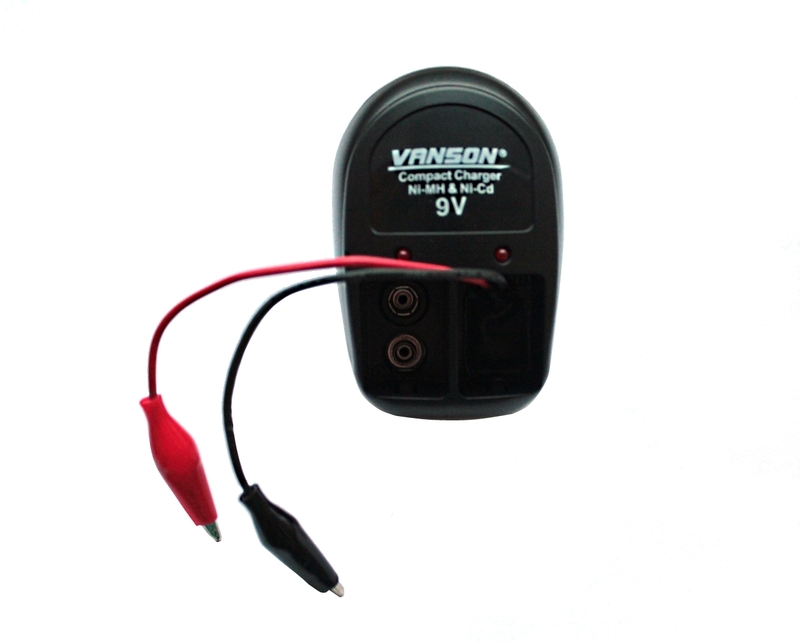 In case of severe or total discharge of the battery, allowed charging time is up to 18 hours. Estimated time of continuous operation when fully charged is up to 120 hours, when using a jumper - up to 50 hours. 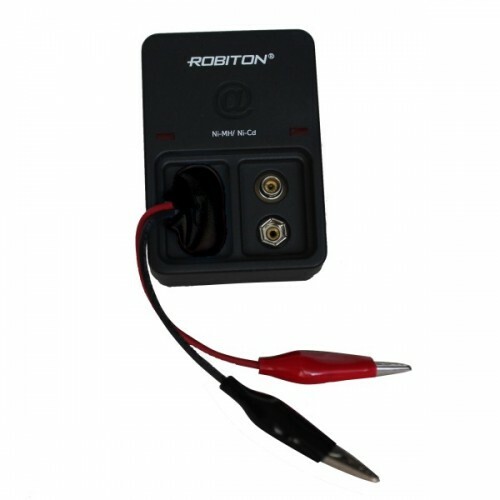 Charging is to be carried out strictly in accordance with markings on the device: first connect the black crocodile clip to the terminal (ring screw) on ​​the black end cap marked with the sign "-", than connect red crocodile clip to the terminal on the red end cap marked with "+". Now, you can plug the device in. 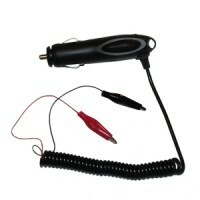 Change of polarity, as well as the closure of crocodile when plugged can cause damage to the device and to the charger. Note! We supply the devices charged. Use only the supplied charger to charge the device. Note! Total discharge of the device is not allowed! 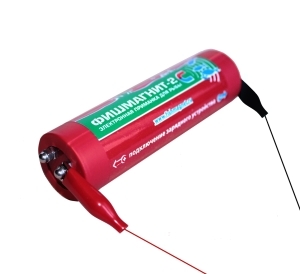 Charging rate of the device is determined visually: if while closing the contacts you can only observe blinking of light-emitting element on the positive red cap and there is no any sound or vibration, the device is discharged. The device is charged if the closure of the contacts causes blinking of light-emitting element on the positive red cap, vibration and sound. Jumpers for positive closing of the device contacts. 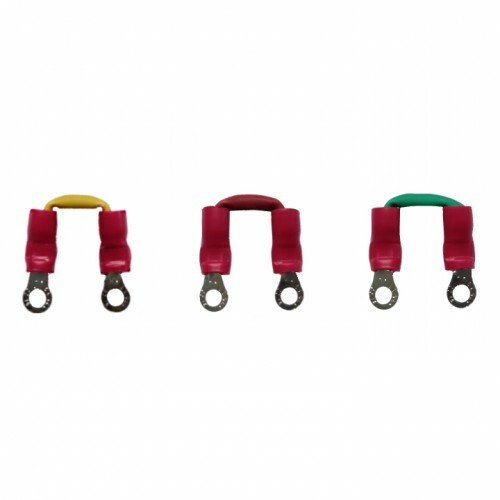 Set the jumper between the contacts on the red positive end cap of the device. 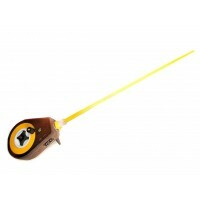 Yellow jumper - the lowest intensity of acoustic, light and vibration signals. 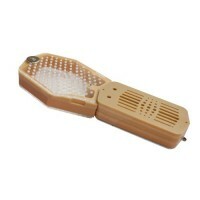 Use when fishing for cautious fish that is afraid of extraneous noise. 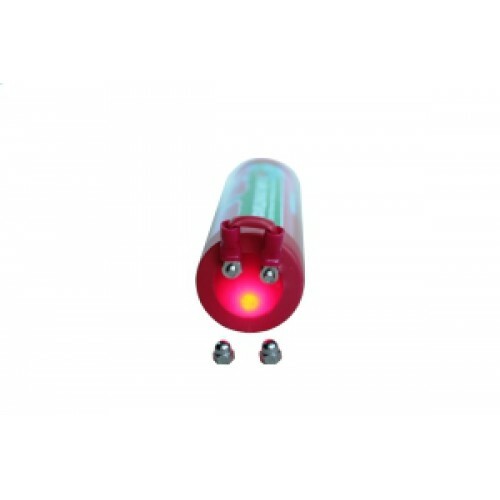 Red jumper - the average intensity of acoustic, light and vibration signals. Use for standard conditions of fishing. 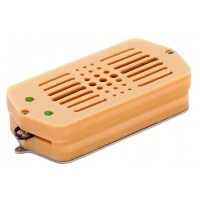 Green jumper - high intensity of acoustic, light and vibration signals. 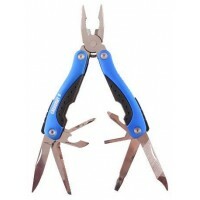 Use for fishing in noisy environment, in mountain rivers and fast flowing rivers. Note! Having finished your fishing take off the jumper! Use only the supplied jumper to close the device contacts! Remove a jumper before charging the battery! Note! Do not take the device apart. The electronic circuit of the device is sealed, after dismantling and, consequently, breaking the seal the device cannot be used. 1. 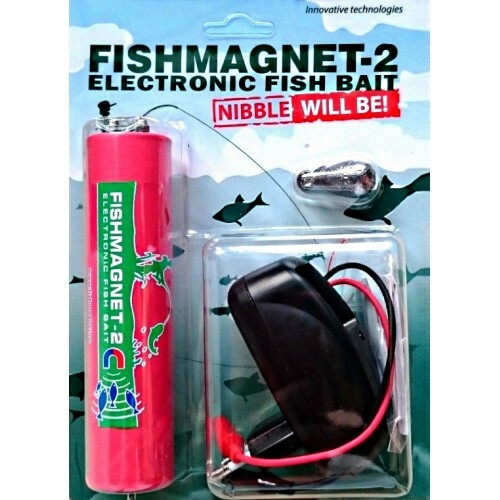 FishMagnet-2 affects and lures all types of fish to a certain extent, but has a maximum effect on predatory and large fish. 2. 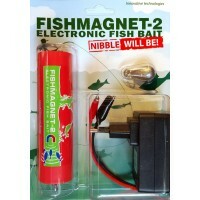 Select the fishing place experimentally when using FishMagnet-2 device. 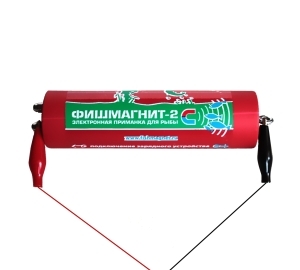 General recommendations: fishing should be carried out within 1-10 meters from Fishmagnet-2 STANDART bait, within 3-15 meters from Fishmagnet-2 UNIVERSAL, Fishmagnet-2 LUX, Fishmagnet-2 LUX MAXIMUM, Fishmagnet-2 MODERN, Fishmagnet-2 MODERN PLUS and Fishmagnet-2 SUPERSOUND (in case of using jumpers to close the contacts). 3. 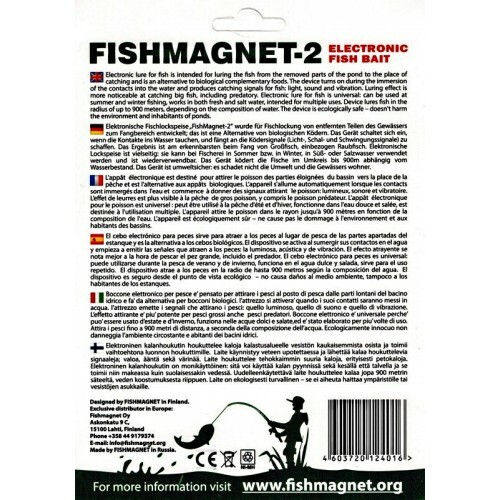 Determinate FishMagnet-2 immersion depth experimentally. 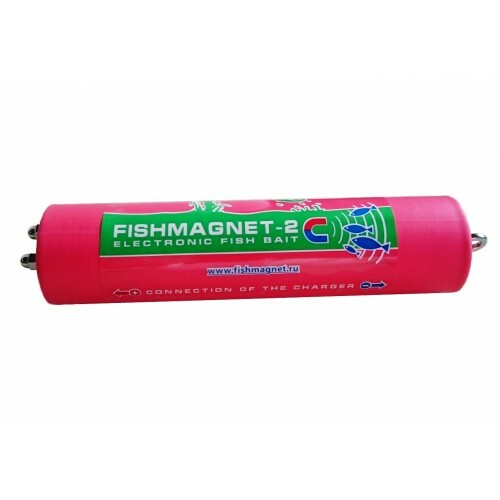 General recommendations: the depth of FishMagnet-2 immersion should be approximately equal to the depth of fishing. 4. Winter fishing: put the device into the neighboring hole in ice (at a distance of 2-5 meters from the hole where you fishing), if it is not possible, put the device in the same hole where you fishing, but at a different depth which is 2-5 meters above or below the fishing depth. 5. Fishing in fast flow: put the device preferably upstream from your fishing place.